Now you can have copies of all your favorite comics from the Wondermark archive! Simply paste the URL or permalink for the comic that you want into the text box above. Important Note: Some of the longer, oddly-sized comics are not available as prints -- but rather as large posters instead! If you have any doubt as to whether the comic you want is considered a print or a poster, please see this page for detailed information. Print Info: Most prints are 15.5" x 8.6", except for the ones with two rows of panels, which are 16" x 12". (A few are even in COLOR as a special bonus, although we're not telling which!) Crisply printed on matte poster stock over an aged-parchment texture, with the mouseover text added classily below. Museum-quality and suitable for framing, if that's your thing. See all the detail lost in the web version! 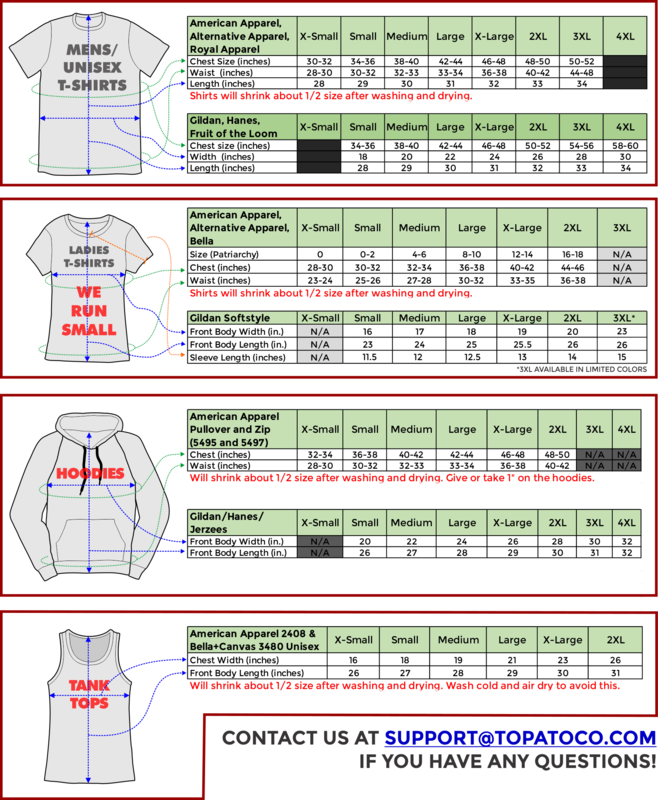 Please refer to these charts before ordering if you are not familiar with the brand of shirt it is printed on! The style of shirt should be identified in the description. Ladies shirt sizes can be especially zany, as many ladies have no doubt noticed in stores. The Human Bird and Paperklip even made an incredibly charming video about those. One thing to keep in mind American Apparel, Royal Apparel, and Alternative Apparel all run about a size smaller than their Gildan/Hanes counterparts. Ladies 2XLs are pretty small, and if you were to be in the market for a Ladies 3XL, the size basically picks back up at Unisex Large. The cut is slightly different but the message is the same: you are cooler than everyone else. Packages—if all items are in stock—usually leave our Western Massachusetts warehouse within 1 - 4 business days. However, if one of your items is currently on Short Delay/Reprinting that means it is currently in production, it may take up to three weeks to ship, but usually much quicker. If you need something for a specific time/event, or would like to split your order, please submit a Support Ticket and we'll see what we can do. We also don't require delivery signatures unless you specifically request it. We currently ship things a couple of different ways. USPS First Class: for packages that weigh 14oz or less. Average ship time 2 - 4 days with delivery confirmation. USPS Priority Mail: for most packages. Average ship time 1 - 3 days with delivery confirmation. USPS Express Mail: for packages that need to get to their destination quickly. Average arrival time is 1 - 3 days and items ordered with Express Mail are automatically prioritized. UPS & FedEx: for packages that come in brown trucks or white trucks. Click here for Fedex standards and here for UPS standards, See the map below for average ground shipping times. UPS/Fedex orders are automatically prioritized. We ship things internationally using DHL eCommerce! Packages ship in 1-4 business days if not indicated Short Delay. You will be responsible for import taxes, customs, VAT, and other country-specific fees upon receipt of your package. We offer DHL Parcel eCommerce shipping options for if you're in a low to medium rush, and USPS Priority Express international for when you need something ASAP and money is of no concern to you. They're priced according to speed and tracking accuracy. DHL First Class: 220 Countries, Final Delivery scan to most countries, 3-21 days. DHL Priority: 220 Countries, Much Better Tracking*, 14 average transit days. USPS Priority Mail Express International: 3-5 average transit days is what they advertise! Please note that we cannot mark packages as "Gifts" to help you evade customs, as that's international mail fraud and they'll throw us in jail which is pointless in a way since no jail can hold us. It is however very inconvenient. Still have a question about shipping? We have a whole bunch of FAQs about specific things that you should go check out.